Well Christmas is really just around the corner...wow where did the time go? Last edited by terrie on Mon Dec 10, 2018 8:11 am, edited 3 times in total. All very cute Terrie! Thank you for hosting. 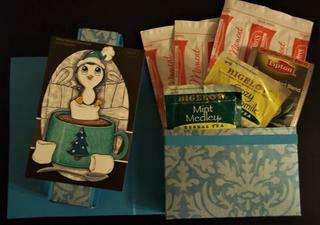 A while ago one of you posted a challenge that used a card gift box with a belly band. I can't tell you how often I use this template to make packets of cards for gifts. This time I'm using it for hot chocolate and tea that are being mailed off to one of my staff who is soon going through her first ever "finals" during freshman year of college. I know that she'll love this. 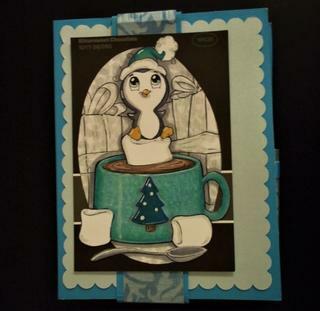 PS The digi is from The Paper Shelter named "There's A Penguin In My Cocoa" and is now on sale for $2.55. Might be worth a visit? Thanks Kathy for doing the challenge. Kathy, your penguin image is adorable! I think it took me longer to pick out the candy than to make the holder. Kathy - I always loved it when my family would send me little somethings during Finals week...and now I get to do it for my kids! Elaine - I love the vintage Santa! This year I decided to make my hubby an Advent calendar (I bought the chocolate kind for each of the kids per their request)....I kept the decorations on the bags very simply as I slipped the first couple into his work backpack! Thanks for doing the challenge ladies. Terrie, I like your challenge! Your treat holders are adorable! Such cute boxes and bags everyone. Just got mine photographed. Mine is a hot cocoa box with marshmallows and a candy cane.